The Doctors Revisited - PETER DAVISON | Warped Factor - Words in the Key of Geek. Over the last twelve days Andrew Jero has been revisiting the last 51 years of Doctor Who and looking at a selection of each Doctor's stories. The final installment in his series takes in the era of the Fifth, Peter Davison. We come now to my favorite Doctor, Peter Davison. I will take a look at two examples of his best stories, two better stories and two of his fantastic stories and with those pieces of evidence justify why he sits comfortably at the top of my list. You may have read my recent article on Kinda (here), which at the time of writing briefly nudged its way to number one on my list of all time favorite stories - my theory on that is I keep fooling myself into thinking there could be something better than the story we're about to get to. But there isn't. Because this one is as close to perfection as Doctor Who has ever got. ...(well it shouldn’t be that big a surprise, just look at my Twitter username) - The Caves of Androzani! Is there anything wrong with this story? NO, there isn’t. It ticks the box for every important element of Doctor Who. The characters are fantastic; it has my favorite actor ever in the lead role; the masterpiece of a script is written by one of my favorite ever scriptwriters (Robert Holmes); it has not just the best one, but the best two cliffhangers ever featured across all 51 years; and to top it all off there is a regeneration. Every important element of Doctor Who perfectly realized. Stotz and Sharaz Jek are my favorite human villains the show has ever given us. Although Sharaz Jek isn’t really a villain by the end of the story, he is perfectly played throughout by Christopher Gable. I believe he is the greatest supporting character in all of Doctor Who, and that’s quite an accomplishment considering the fact that he’s wearing a mask which covers his entire face (minus lips and eyes) for the whole story. The voice is what really brings the character to life, coupled with the slow building anger and restraint. It's a masterclass in performance and just shows how great an actor Christopher Gable is. Stotz’ character is unpredictable and keeps the story interesting, his eventual partnership with Morgus, who, is the biggest villain of all, ends justly. 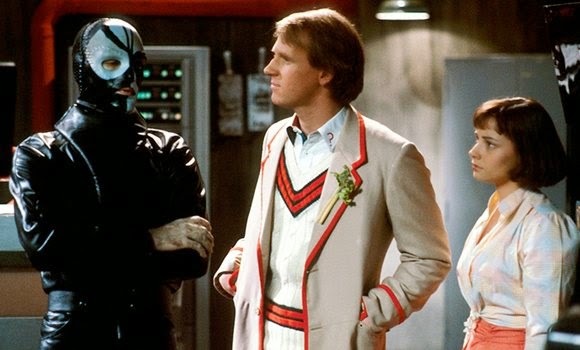 The Caves of Androzani is the one story I’ve never grown tired of, I could watch it over and over again with no problems. During my earlier high school years I would watch it three, maybe four times a week. It's the most perfect, fitting end for the Fifth Doctor, sacrificing himself for someone he has only just met. Forever the hero. It's just one reason why this is, without a doubt, the greatest story ever told from the greatest show in the galaxy, and if ever I say anything is better, I’m lying to myself! I would talk about the other three Davison stories which feature inside my Doctor Who top ten list, but I’ve recently written articles on them, Resurrection of the Daleks, Earthshock and Kinda, so I’ll jump down my list a little to another favorite of mine (who am I kidding there isn’t a Davison I don’t love!) Planet of Fire. What Fifth Doctor article would be complete without at least one story featuring the Master? Such an important part of the Fifth Doctor's era, he was there from beginning to end, and Anthony Ainley is fantastic here. He delivers his second best performance as the Master (his finest coming in Survival), and his death scene is the greatest one he ever had - I mean, he had five of them, so this one is the definitive death of definitive deaths! We have another really good storyline here, I especially loved getting to see Turlough’s background filled in and finally finding out why he was at the school in Mawdryn Undead to begin with. Mark Strickson does a fantastic job (as usual) and gives his character a really memorable sendoff, and leaves with his friendship with the Doctor intact. The score is also awesome and one of my favorites to listen to. A definite 10 out of 10. Warriors of the Deep also marks, what is in my opinion, the beginning of the end of the Davison era. 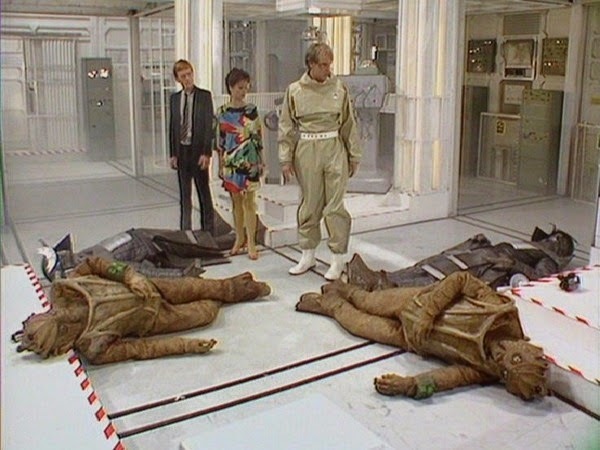 The deaths of all the Silurians and Sea Devils starts the trend of death which causes his era to unravel, after all Tegan’s departure in Resurrection of the Daleks is due to this. Peter Davsion's Doctor was one who seemed to keep the peace more than the others, but in extreme circumstances he seems to go the farthest. 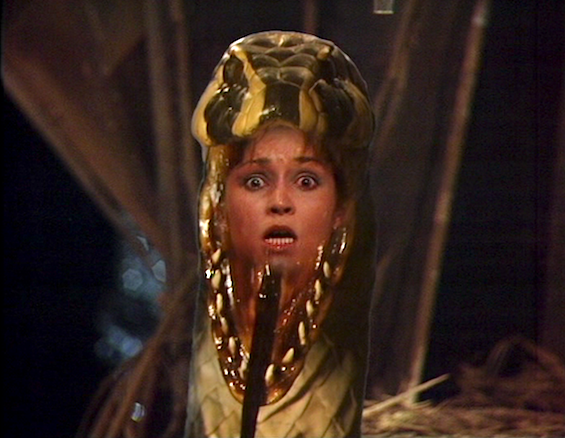 The second of the better Davison stories I’ll talk about is Snakedance, the sequel to Kinda (which is, as I mentioned earlier, my second favorite story of all time). While Snakedance isn’t quite as strong as Kinda, it is again one of the creepiest. It also helps that this is Sarah Sutton's best performance as Nyssa, although it is in Janet Fielding's performance as Tegan that makes the story really soar. The pair of Mara encounters are two of the only companion driven stories that I really enjoy, most of the ones presented post 2005 have been pretty crap, if I'm honest, but writer Christopher Bailey really brought the best out of Tegan. Trying to find two bad Davison stories is an impossible task. I simply love his era, and everything about it. It's true that Time-Flight is certainly the weakest, but, again, it's one I've written about recently. In fact I was defending it (you can check that out here), because even if I attempt to watch it impartially it really isn't as bad as fandom seems to think it is. Above Time Flight, I guess I'd go for Black Orchid - a story that I'd still give an 8 out of 10. It was the last ever-historical story in all of Doctor Who (I wish they would do one with Capaldi, he seems the perfect Doctor to resurrect this), and kind of feels a bit like a filler. Not bad in any way, just a fun little piece which fills up two episodes of the 26 in the season. It's only here because it's not an essential story. 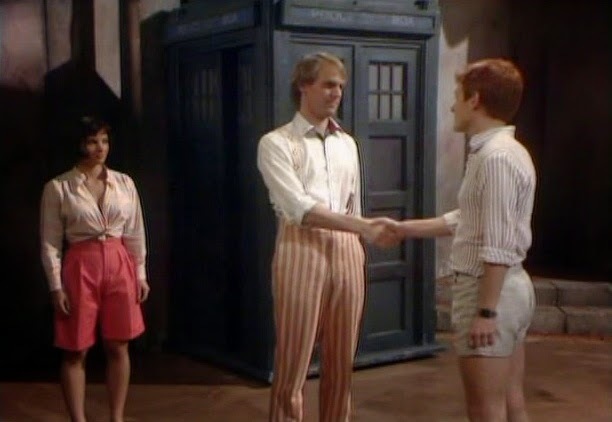 I struggle to name any other weak story from the Fifth Doctor, so I'll go with the one which Peter Davison has named his least favorite of his era, Four To Doomsday. Personally I don’t know why he felt that way. The script is pretty good, the concept is very interesting and the execution of the story is pretty good, while the Urbankans aren’t the best-designed aliens in Doctor Who they certainly aren’t the worst, by a long way. 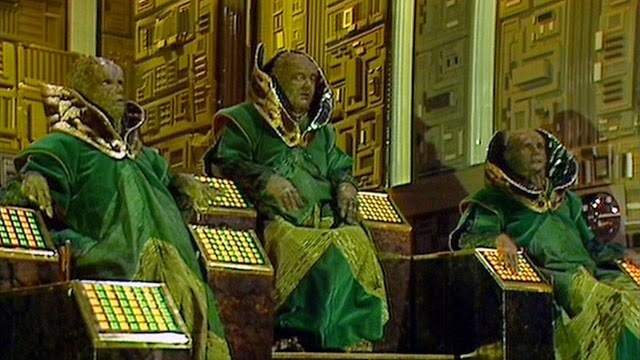 Plus Four To Doomsday has two really cool cliffhangers, part two and three, the latter being made even cooler by the Doctor referencing it during part two of The Visitation when he is about to be beheaded again. So if this is, as Peter Davison himself thinks, the worst story from his ear, it gets a 9 out of 10 from me. Overall Peter Davison's era of Doctor Who is the best that the show has presented during its first 51 years. I'm not sure it can ever be topped. Has that got something to do with Davison being my Doctor? Probably, he wasn't my first Doctor but his era was the era I grew up with and the one that will always remain the closest to me. 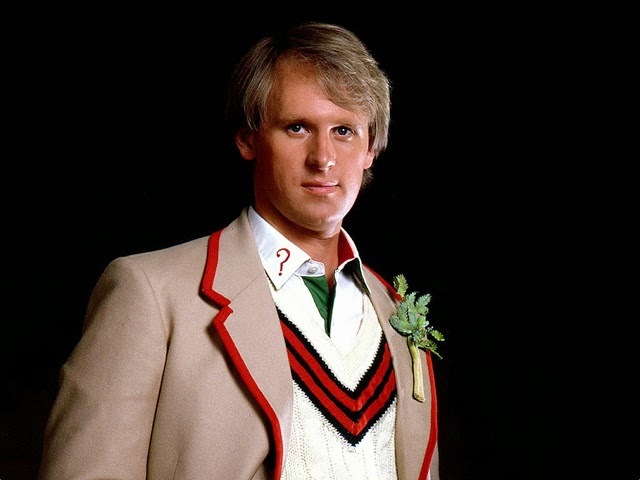 But even when I've introduced people to these stories, people who have never watched Doctor Who or only know the modern series, they all agree that Davison's stories stand up so well. So if you have only been watching post-2005 and are looking for a way to get into the classic series, I get that it can be daunting, 26 seasons and 7 Doctors, where do you start? Believe me, the Fifth Doctor is your way in. You'll fall in love with 'Classic Doctor Who' (as I did when it was just 'Doctor Who'), and discover some amazingly written adventures. In a time when budgets were much tighter and special effects were limited, Doctor Who stretched those limits week after week, and complimented them with brilliant plots and characters you can really care about. I believe that was never more true than in the Davison years.